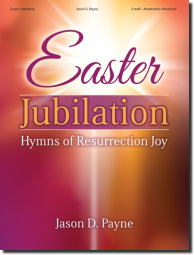 This volume of Jason Payne's popular "Jubilation" series celebrates the risen Christ and joyfully proclaims the news of the resurrection with well-known and beloved Easter hymns. Each setting presents the familiar tune and adds original ideas and themes. These thrilling and joyous arrangements will inspire organists and congregations with the good news of Easter. Trumpet Tune on "The Day of Resurrection"